800 MHz timing with 4 M deep memory enables you to find the root cause of a problem that is widely separated from the symptom in time. 200 MHz state acquisition provides you performance and headroom for synchronous system measurements. Simple and Quick triggers let you define triggers you need in the context of signals you are viewing. Use pull-down menus within data displays to define trigger events as edges, patterns and glitches (Simple trigger) or draw a box around a suspect event in the display to see if it reoccurs (Quick trigger). Advanced trigger lets you use drag-and-drop graphical icons as building blocks to customize complex trigger scenarios to find the most elusive problems. Time correlated measurements between an external oscilloscope and the logic analyzer help you determine how the analog quality of a signal impacts the digital operation of your device. Offline analysis allows you to analyze previously captured data on a Windows PC leaving your logic analyzer free to capture additional data. PC-hosted version provides small footprint, saving valuable workspace. View your captured traces at the display size and resolution of your PC. An IEEE 1394 port provides direct connection to a 500 MHz minimum Intel Celeron or AMD K-6 II (or equivalent) PC running Windows 2000 Professional. 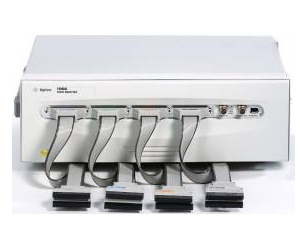 136 channel PC hosted logic analyzer.